The LAST EVENT in a project space at the current location! 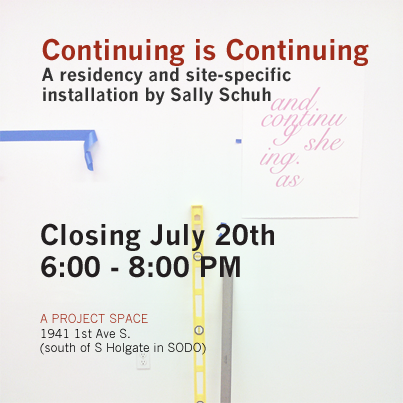 Join us for the completion of Sally Schuh’s installation Continuing is Continuing and the final reception at a project space to celebrate all the exhibiting artists. a project space is leaving its current location on July 31st 2013. Stay tuned for news about the evolution a project space and what’s next on the website. Click the follow button to the right to avoid advertising on the webpate and receive notifications of new posts by email. Visit the blog page for all the latest updates. A suite of four prints has been created especially for ‘Continuing is Continuing’. A limited edition will be available at a discounted price of $60.00 each and $200 for the set during the residency. After July 20th the pieces will be priced at $125 each and $400 for the suite. Details: 15″ x 11″ archival digital prints on pale blue Magnani Pescia paper in a varied edition. This month a project space presents Continuing is Continuing: An Artist at Work, a site-specific installation exploring the nature of work by Sally Schuh. The month-long residency begins with an opening Saturday June 15th, and closes with a reception for the completed installation on Saturday July 20th. The venue will be open to the public by appointment to view the work in progress throughout the month. Photographs documenting various points in the process will be posted on the blog and on Facebook.